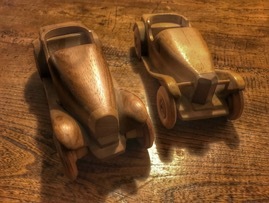 These are some wooden cars that I created long ago, the first and most basic when my neice Hannah was a toddler, she is now a mother with a toddler of her own… The two more refined models I created shortly after my own son was born, getting on for 27 years ago now. But the story of them goes back long before that. When I was in middle school, age 12 or 13, we did woodwork. I made various things to the teacher's plan and direction, a coffee table in oak, a standard lamp, these are the two I remember, and they were good, well made, professional, especially as I was so young. In metal work I made a hammer, screwdriver and G clamp, with lathe work, annealing and tempering, cutting threads and casting - a bit scary -I think my dad still has these tools. But, however good these items may have been, and however much they taught me, they were not my own creative work, and hence did not satisfy me. 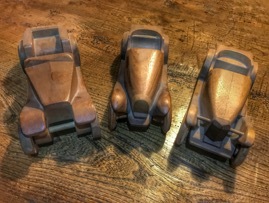 I wanted to make a wooden toy car, specifically a Land Rover, as I was obsessed with them (even then). Eventually, I guess I badgered the poor teacher so that he let me - but then I didn't succeed to create the model that I had in my head, and the teacher couldn't help, as I had cut myself adrift - and he had all his other students to look after.